I have always ran my mid/high panels on my Betas with a krell Fpb400cx. A friend let me borrow A pair of Primaluna Prolouge 6 Amps with Kit-120 tubes. They sound really nice but I am not sure if they are powerful enough for the Job. I have a line on a nice set of Vtl 300 deluxe mono blocks. I quess my question is what would I gain with the extra power. I listen at maybe moderate levels at best. It's not so much the power as the wavering impedance curve with a low of 1 Ohm, far lower than most tube amps recommend, and the wavering interacts poorly with tube amps, in the sense you won't hear a flat response anymore. I might suggest you see if anyone has produced a better crossover for these speakers. If so, I bet they fixed the impedance issues. Otherwise, stick to beefy SS. One tube amp designed specifically for problematic low impedance loudspeakers is the Music Reference RM-200. It even has a 1 ohm tap! 100w/ch from a pair of KT-88 or 6550 tubes/ch. I recommend a new set of x-overs from dstechlabs.com (Fort Lauderdale, FL). SS amps like the big Threshold Class A mono’s with preferably ARC tube mono’s driving the mid/high panels is a well worn path. I recall Arnie Nudell voiced the IRS speakers with ARC tubes up top. The key is you need powerful ss amps to drive the bass towers, and reasonably powerful tube mono’s to drive the mid/high panels. Basically the more power, the better. One solution for such an impedance curve is a set of ZEROs (www.zeroimpedance.com) which will put the Betas in the range that most tube amps can handle. i always took the Opus 3 depth of image LP with me when setting up..
oh ya, I still do !!!! When they were first shown in Australia many moons ago at the Amada Conference Room Artarmon, the importer Ceto from Audio Excellence gave the old propaganda speech before playing them. In that speech before we listened he said after conversing with Arnie Nudell, many will ask why we have the big Audio Research mono blocks on the bass and the (just as big) Threshold monoblocks on the mids and highs. 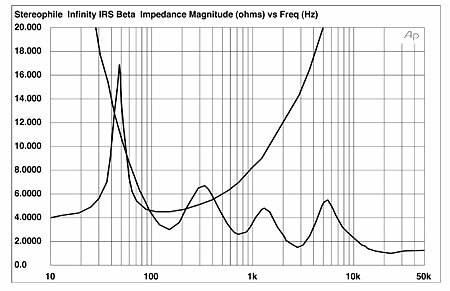 It was because of the IRS Beta’s impedance curve, it sounded better this way in the mids and highs and the bass was still in control with the tubes on them, with the tubes on the mids and highs there was a distinct lack of hf extension, air and dynamics. This is what was said on Stereophile with VTL300’s on the mids and highs " with a rising output impedance with frequency will produce a sound that is much mellower in the treble"
" Mark Levinson No.20.5 amplifiers produced a sound from the Betas possessing considerably more HF energy than the VTL 300 tube amplifiers". I would suggest a good powerfull solid state with high Class-A ability, not the Krell plateau biasing class-A, I’ve never thought that system sounded like it should of. @georgehifi, You said it yourself "many moons ago"...let’s say customer A has a nice used pair of Beta’s, a fully refurbed Threshold S/500 Series II (of which you’re very familiar) and a 2nd hand ARC Reference 110 with new NOS tubes, where are you going to put the tube amp? Obviously on the mid/high panels. Today, refurbs and better NOS tubes offer performance gains which surely allow a fresh baked look at amplification options on old legends like the IRS Betas. A tube amp with a low output impedance, like the Music Reference RM-200 Mk.2. But is 100w/ch enough power? I often wonder if they are worth the hassle and what would I replace them with. I would like to pick up the Vtl 300’s and give them a try but I have concerns there as well. I know they are long in the tooth and worry about reliability issues. I spoke with bea at Vtl and although pleasent to talk to the vibe I got was they really don’t care about past Products they would rather promote the new which I get but with a daughter in college my budget won’t allow it at this point.I love my Infinity speakers of which I have the Betas of course and the Gammas, Ren 90’s, Kappa 9. I cannot seem to find much information or opinions on the Vtl's. You said it yourself "many moons ago"...let’s say customer A has a nice used pair of Beta’s, a fully refurbed Threshold S/500 Series II (of which you’re very familiar) and a 2nd hand ARC Reference 110 with new NOS tubes, where are you going to put the tube amp? This would still knock the HF out of the tube amps, on the Threshold s/500 things will remain flat out to 20khz. And the Ref110 should cope still with the bass tower impedance, it doesn’t go below 5ohms on the Stereophile graph. I have had a set of IRS Betas for just over 10 years now, and still have my original pair of Quantum 5s. In the past I have also had Kappa 8s, Kappa 9s and IRS Delta's.To power them properly & safely, I personally have had good results with the older vintage Threshold amps, S300 MKII, S350e & S500e.I have also had good results with modified Halfer amps as well, some moderately modified stereo DH200 and DH220s, and more recently a pair of extensively modded mono Hafler DH200s with custom driver boards.With the Betas I like to use the modded mono Haflers on the mid-high towers and the Threshold S350e on the bass towers, and that setup has power to spare and is the best sounding combination so far.Last year I picked up a pair of Doge Audio tube mono amps, and they do a a nice job on the mid high towers in class A mode. They do run very hot though, definitely need to make room for them to breathe.For the Haflers, I usually do not push the idle current, so they run warm but are not outrageous power consumers.The only thing I regret is not having a big enough room to do the Betas justice.Even so when people hear them for the first time they are blown away. I like the RSIIa/bs, impressive sound and looks in a single tower configuration. Do you remember what you paid for them? I have a buddy right now who tracked down a good used pair of RS11s, they are nice but not the same without the emims like you had.A few years later (1987) is when I picked up my IRS Deltas, at the time they were $9500 Cdn, I traded in my Kappa 9s and had to sell off a car I was building to help pay for them. I still regret not hanging onto the Deltas, parted with them in 1990 when I moved to another province for work. We've had several customers with Betas. They used our more powerful amps- so despite the lower impedances they don't seem that crazy to drive. 200 watts seems to do the job.